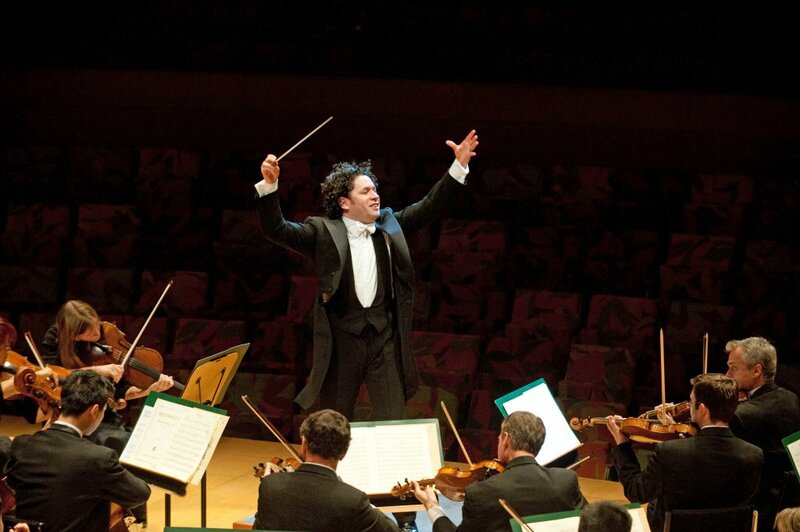 Founded in 1919, the Los Angeles Philharmonic, under the vibrant leadership of Music & Artistic Director Gustavo Dudamel, is recognized – both at home and abroad ­­– as one of the world’s outstanding orchestras. Leading the way in ground-breaking programming, on stage and in the community, the LA Phil offers a diverse range of programs that reflect the orchestra’s artistry and demonstrate its vision. Please Note: The LA Phil’s 2018 radio season continues to be available until the end of June, when the 2019 season releases. Please see the bottom of this page for highlights of the 2018 radio broadcast season! More than 250 concerts are either performed or presented by the LA Phil at its two iconic venues: the Frank Gehry-designed Walt Disney Concert Hall and the Hollywood Bowl. During its winter season, with approximately 165 performances at Walt Disney Concert Hall, the LA Phil creates festivals, artist residencies, and other thematic programs designed to enhance the symphonic music experience and delve further into certain artists’ or composers’ work. The organization’s commitment to the music of our time is also evident throughout the season programming, as well as in the exhilarating Green Umbrella series and the LA Phil’s extensive commissioning initiatives.The orchestra’s involvement with Los Angeles extends far beyond symphony concerts in a concert hall, with performances in schools, churches, and neighborhood centers of a vastly diverse community. Among its wide-ranging education initiatives is Youth Orchestra LA (YOLA). Inspired by Venezuela’s revolutionary El Sistema, the LA Phil and its community partners provide free instruments, intensive music training, and leadership training to nearly 1,000 students from underserved neighborhoods, empowering them through multi-year engagement to be college-ready and on a path to becoming vital citizens, leaders, and agents of change. Since its first season, the Philharmonic has made downtown Los Angeles its winter home. It was in December 1964 that it began its residency at the Dorothy Chandler Pavilion of the Music Center of Los Angeles County, and in the fall of 2003, the Philharmonic took up residence in the acoustically superb, stunning Frank Gehry-designed Walt Disney Concert Hall – the fourth performing venue in the Music Center complex. At the same time, the Los Angeles Philharmonic Association vastly increased the number of concerts it presents during the winter season, which now includes pop, jazz, world music, organ recitals, Baroque concerts, holiday programs and much more. Music & Artistic Director Gustavo Dudamel leading the LA Phil with Martin Fröst (clarinet), Jessica Pratt (soprano), Julia Bullock (soprano), Paul Appleby (tenor), and Elliot Madore (baritone) in an all-Mozart program. Performances by noted soloists (in order of appearance), including Gidon Kremer, violin; Janai Brugger, soprano; Leila Josefowicz, violin; Laura Claycomb, soprano; Christophe Dumaux, countertenor; Hilary Hahn, violin; Sergio Tiempo, piano; Joseph Pereira, timpani; Maraca 2, percussion; James McVinnie, organ; Richard Goode, piano; John Holiday, countertenor; Julianna Di Giacomo, soprano; Jennifer Johnson Cano, mezzo; Michael König, tenor; Davóne Tines, bass-baritone; and Mitsuko Uchida, piano. Guest conductors including: Mirga Grazinytė-Tyla, Principal Guest Conductor Susanna Mälkki, Emmanuelle Haïm, Dudamel Fellow Jonathon Heyward, Xian Zhang, James Conlon, and Andrew Manze.